"Can a lion share a cupcake with an astronaut under the sea? You have the power to decide -- choosing characters, taking them on adventures and creating your very own story along the way. 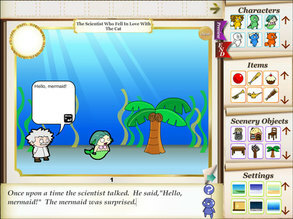 my StoryMaker® lets you control characters and objects -- and it creates sentences for you! Or, you can enter your own words." my Storymaker® was named one of the Best Websites for Teaching and Learning by the American Association of School Librarians, a division of the American Library Association.